This is one of those amazing stories that sticks with you forever. 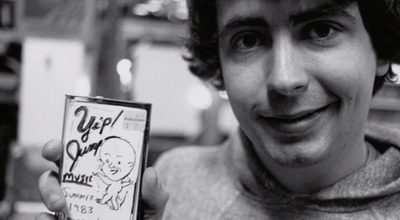 In the beginning, a few decades ago, Daniel Johnston is a very talented kid who makes weird art and music and also records his life on film. He hopes to be a famous artist some day. 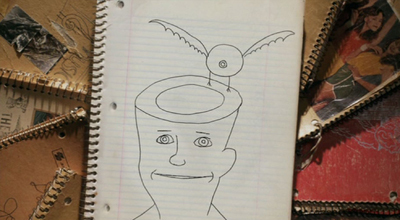 But his art and life get weirder and weirder. He keeps recording his life, but it is clear to others he is going crazy. He is racked by “demons” — which is what his Bible-believing parents and Daniel himself believe. 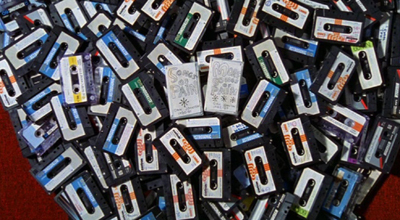 Yet, Daniel acquires thousands of true fans who see him as a genuine outsider artist and musician who makes visionary basement cassette tapes. Over time Daniel slips into self-destructive behavior until he is “rescued” by his father who whisks him away in a small plane. Then Daniel yanks the keys out of the plane in flight. 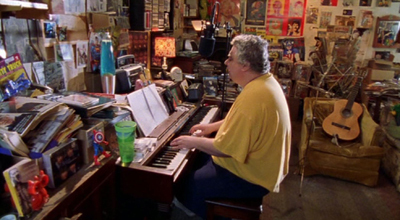 It’s the devil in Daniel Johnston his father says, and by now you believe it. You just gotta see this movie, in large part made by Daniel himself. It’s a cult classic. 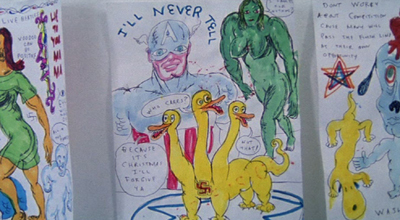 I fell in love with Daniel Johnston years ago. 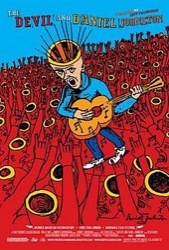 I took my now girlfriend to see The Devil and Daniel Johnston for our first date. I guess she likes me for wanting to see me again after that. I see him live every time hes in town. Iv gone as far as seeing him 2 days in a row. Everyone should give his music a chance. Yeah I agree. It’s an amazing documentary, about how something so beautiful, his voice, can come from such dark and difficult times. I am seeing him live next week, it is the first time he has ever been to australia! Catastrophic Theatre company in Houston has produced two plays based on Johnston’s work/life. Their latest, “Life is Happy and Sad“, ran last month in Houston, and there are talks to take it to Austin this spring, from what I’ve heard. It was pretty amazing, and while Daniel himself was a bit distracted the night he saw it, his family & handlers all praised its accuracy and his portrayal. Wonderful list..wonderful work, thank you so much. I would like to recommend a new film, Wretches and Jabberers. It is a documentary about adults with autism. It not only reveals much about our common humanity, it can also be seen as a very direct expression of technology helping us to realize our common humanity.